Most of the people in the long line donated much more than the suggested 7 Canadian dollars, or $5.50, for the buffet to Ruth and Bob Kienlen, who were managing the cash box at the door. The retired couple, like many in this community, once billeted members of the Broncos. The custom of players’ living with local families means the deaths double the number of parents affected. In a new subdivision behind Humboldt’s hospital, David and Rene Cannon were hosts to three players killed in the crash: Xavier Labelle and Logan Hunter, both 18, and Adam Herold, whose 17th birthday would have been on Thursday. A pancake breakfast at St. Augustine Catholic Church in Humboldt on Sunday became a fund-raiser for the families of the those killed in the crash and the injured survivors. The outsize role the team plays in Humboldt was obvious even on the outskirts of town, where a large sign on the highway at the Humboldt exit called for prayers for the team. On the main street — named Glenn Hall Drive, after the hometown hero, a goalie who went on to the National Hockey League, winning two Stanley Cups — gold, green and white Broncos jerseys hung behind counters in shops, restaurants and hotels. It seemed almost everyone in town was wearing green lapel ribbons to honor the team. The Humboldt arena has a capacity of 1,854 — a seat for every 2.6 residents, given the town’s official population. Yet during playoff games, like the two held against the Nipawin Hawks this past week, the arena is so full of spectators that it’s standing room only. 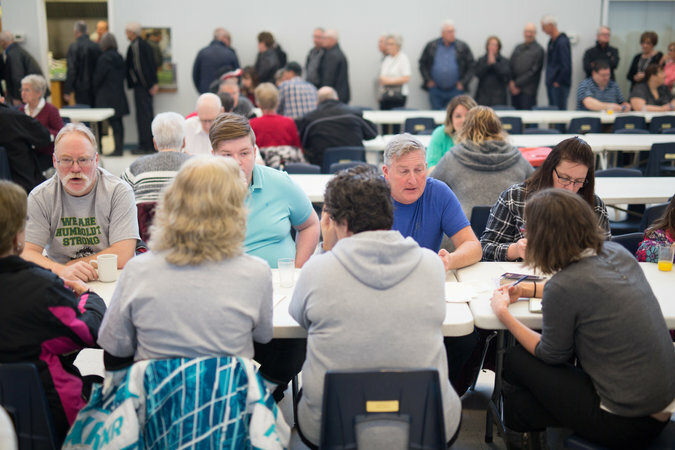 The town was in a daze on Sunday as preparations were underway at the Elgar Peterson Arena for a vigil to remember the dead, instead of what had been scheduled for the evening: the sixth game of the Saskatchewan Junior Hockey League playoffs. Prime Minister Justin Trudeau attended the memorial service. While junior hockey players are not paid, the competition to join top teams like the Broncos is intense and involves recruiting, networking and even a draft. The Saskatchewan Junior Hockey League is one of 10 such Junior A leagues spread across Canada, the elite amateur tier for players 16 to 21. Its most skilled players aspire to one of the country’s major-junior leagues, where the players are paid and the teams act as development squads for N.H.L. teams. Saskatchewan has a history of producing a disproportionate number of N.H.L. players relative to its population of 1.1 million. Currently, 31 active N.H.L. players come from the province. But Mr. Brockman, the former coach, said that whatever dreams of N.H.L. glory the young players harbor, their practical objective is generally to attract a hockey scholarship from a Canadian university or an American college. 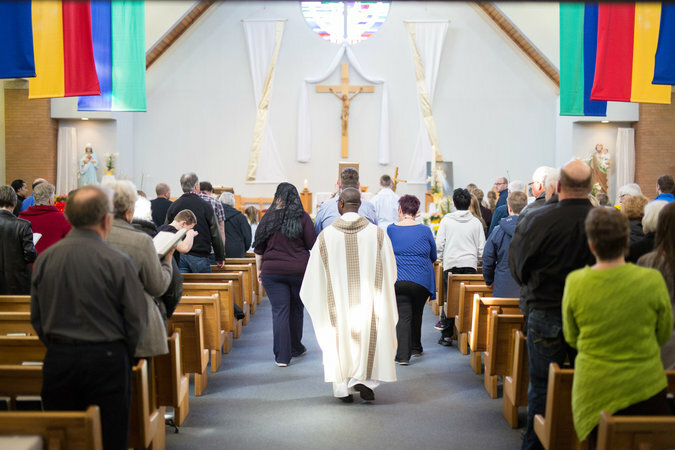 Mass at St. Augustine Catholic Church on Sunday. On top of a heavy training and game schedule, the younger players on the Broncos attended the local high school, which is part of a municipal complex that includes the arena, meeting halls and a curling rink. Many of the older players took University of Saskatchewan extension courses at a community college. Mr. Labelle, a Broncos defenseman and the son of an emergency-room physician in nearby Saskatoon, not only excelled at hockey, he was also an accomplished piano player. A regional C.B.C. radio program played a recording of a performance by him on Sunday. The Broncos have an annual budget of about $700,000, and the team and the town come with up with novel approaches to raising money. One year, the team ran a lottery for a new combine harvester, a piece of farm equipment worth several hundred thousand dollars. And a group of local farmers have set aside 160 acres for the team and turn over the proceeds of the grain it yields to the Broncos. The collision has prompted a national, and global, outpouring of support. A GoFundMe campaign for the team was nearing its goal of 4 million Canadian dollars, or $3.1 million, by late Sunday afternoon. Not all of the victims were players. The injured included a team trainer, and the dead included Tyler Bieber, 29, who did the play-by-play announcing for the Broncos’ radio broadcasts. The death of Brody Hinz, the team’s statistician, particularly stung at Westminster United Church, where he was long an active member of the congregation. He was about to graduate from high school; Mr. Hinz’s father died from cancer when the son was just 5, the Rev. Brenda Curtis said. Minister Curtis, who has spent much of her time since Friday with Mr. Hinz’s mother and younger sister, was similarly at a loss. An earlier version of this article misspelled the name of a former coach of the Broncos. He is Dean Brockman, not Bookman. ← In John Bolton, Trump Finds a Fellow Political Blowtorch. Will Foreign Policy Burn?